This article was edited on 22 October, 2007. Same info, words are reconstructed to make more sense. The first short movie to be shot with RED Digital Cinema cameras, Peter Jackson’s short World War one film entitled Crossing the Line, is making a slow trek to the net in bits and pieces. Today, 4k frame grabs (in compressed JPEGs) and a short Quicktime excerpt (at 1k) were released. They are hot. For those wondering “what is RED?”, basically this is a camera that is better than film quality. Think the size of film with no grain. (Unless of course you want it.) The camera is entirely digital too, so you don’t have to worry about any complex scans – just import the data off your RED Drive (or whatever storage method you choose) onto your computer and process it with the included software. Further, the camera is modular, like a LEGO toy. Don’t be tied into your camera manufacturer’s configuration, switch it up however you like. There is no limit to the number of combinations you can assemble. What’s best is the price – at only $17,500 indie filmmakers (and studio filmmakers) will save millions of dollars because they don’t need to worry about film processing (think of what you save by not having to develop dailies) not to mention the price of the film stock and the film camera themselves. For the price of a new car you have better than anything available now. This is revolutionary. Furthermore, RED is backed by Jim Jannard (creator of Oakley sunglasses) so we know there is a name to trust. Jim communicates frequently with RED fans at REDuser.net in an act of radical transparency. Even after seeing this 1k sample, it’s apparent that the RED will be a force to be reckoned with. This is a defining moment for the digital revolution. Find the video and credits at REDUser.net and the stills at RED.com. Images copyright 2007, Wingnut Films. Used for educational purposes. We (and by we I mean this site, Gizbuzz, and FOSSwire) are now available for constant stalking on the nano-blogging social network Twitter.com. Twitter is like an away message on steroids. It’s insanely addictive, and all the Oratos bloggers have accounts. After some deliberation on our network mailing list, we decided to create a Twitter account that would automatically post the latest post from each of our network blogs. You could then follow that account (which happens to be located here) and it would tell you about a new post the instant it happened. If you aren’t a Twitterite, you can always utilize this feed for notification purposes. Twitter can send you IM or SMS updates too, so you can always be in the loop. Of course if you want to follow our exciting lives too, you’ll find links to our profiles at the network page. Again, it’s located here. If you find this useful, let us know! Our email address is editor (at( youmakemedia )dot) com. Ogg Theora is a relatively new codec (as they go) for video. It’s an open format, much like the OASIS OpenDocument format. Theora is based on VP3, targeting MPEG-4 codecs. Because of its young age, their aren’t nearly as many tools for transcoding into Ogg Theora compared to, say, H.264. We have to use tools that aren’t dedicated to the cause. Here we’re using VLC, the wonderful free/open source media player we’ve written about in the past. Again, VLC is not a dedicated transcoder, so your mileage may vary. In fact as I’m writing this post I’m talking with Peter from FOSSwire (another Oratos Media blog) who is having some difficulty transcoding a video into Ogg Theora. The first step is to get VLC. Head over to http://www.videolan.org/vlc/ and find a download for your platform. Now you want to open your file. Make sure it plays in VLC, and check it against the transcoding list so you don’t get any unpleasant crashes or errors. Once you’ve done this, open the “Streaming/Exporting Wizard”. This will enable you to change all the fun format stuff and determine export quality. This screen is where you choose the video that you want to transcode. As you see in the screenshot, you simply click the “playlist” option and select your video. You can then advance to the next window. The option is also available to choose what portion of the video is transcoded. This next window is likely the most important: it’s where you choose the output format. The screenshot here outlines the formats that you’ll want to convert to. 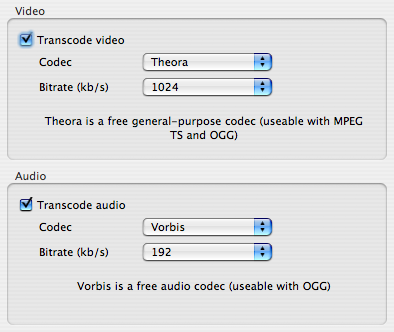 Make sure you choose Theora as the video codec and Vorbis as the audio codec. We use 1024 and 192 as the video and audio bitrates (respectively) but the choice is ultimately up to you. The next window in the wizard gives you the option (or not) of the Encapsulation format. OGG is the only available choice, so you will have to accept it and move on. Don’t get confused – Ogg is colloquially referred to as an audio format. Actually, Vorbis is the real name of the audio codec (that’s why we chose it above). Ogg is just the bit that wraps it all up nicely. Finally, you can save the file. You probably shouldn’t check “Local playback” either. The name may make you think it’s necessary if you want to be able to play your output file on your computer. 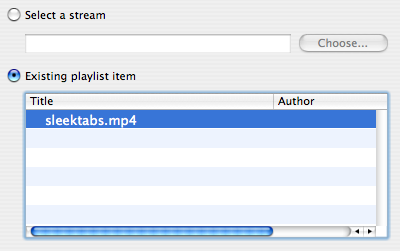 The name is misleading though – they’re actually just asking if you want to have the file playback while it renders. Unless you have a lot of RAM to give up, you’d be smart to pass this up. Then press Next and your file will begin cooking. Once it’s done, you will ideally have a new Ogg Theora file to share with the world! If you’re a Mac user, you can test playback in VLC or by using the components available from Theora’s open source home, Xiph.org. It might be slightly out of wack in Quicktime, so VLC is recommended. Windows users can also use these two techniques. As for Linux, any decent Linux media player should be able to play Theora. You guys invented the format after all!